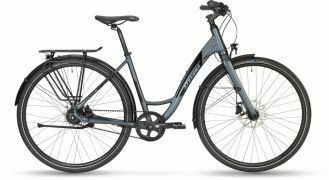 A test by My Bike tells what it takes for bikes to be low-maintenance, but fun to ride at the same time – exemplified by the STEVENS Courier Luxe. 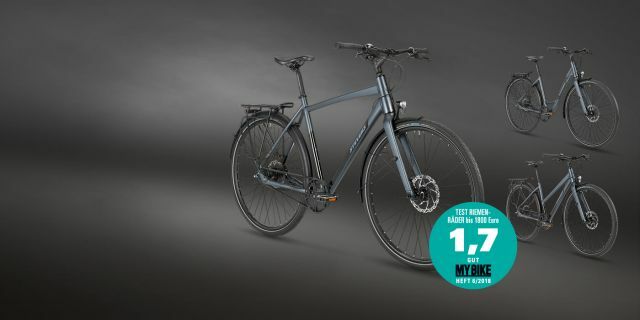 The Courier Luxe somehow does everything well, says My Bike in its test of “low-maintenance long-distance runners“ with belt drive and other specs that occasionally require some maintenance, yet not a lot and not very often. Conclusion: The Courier Luxe somehow does everything well: Seating position is perfectly relaxed, yet with a sporty touch. Seating and handlebar position are just as flawless as its always secure handling, balanced steering and immediate acceleration. The STEVENS Courier Luxe is available in the Gent/Men’s version in sizes 48, 52, 55, 58, 61 und 64cm for 1,499 Euros. In the Trapezoid/Women’s version it sells for the same price and is available in sizes 46, 50, and 54cm, as well as in the Forma/low-instep variety in sizes 46 and 52cm. The belt drive from Gates as used by STEVENS not only in the Courier Luxe “meanwhile has become synonymous with maintenance-free bicycle drivetrains”, says My Bike. Its advantages: It does not wear-out and requires absolutely no lubrication – if everything goes well.” Yet it is important for the belt to last 20,000km that it is tensioned in a well-defined range and that the chain line (or rather belt line) – the line between chain ring in front and sprocket at the rear – is exactly straight. Because of that STEVENS recommends a regular review by a certified dealer. 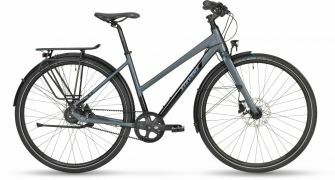 One basic characteristic of the belt drive is that it only works in combination with a gear hub like the 8-speed Nexus hub from Shimano in the STEVENS Courier Luxe. Such a hub also requires regular maintenance according to the manufacturer. Just have it checked on a yearly basis by your STEVENS dealer. Another argument for low-maintenance long-distance runners is hydraulic disc brakes. They are powerful, offer sensitive modulation as well as fast and reliable performance in the wet, as listed by the editors. In all STEVENS every-day use bikes from 750 Euros up, they are standard equipment. One of the criteria for the attribute long-distance runner the editors chose is tires. 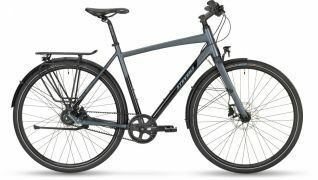 Especially in autumn and winter the demands in the contact patch between wheel and surface can be high: “The STEVENS offers enough clearance for 42mm studded tires.” Anyone who wants to change tires on their current STEVENS trekking, city or city cross bike models can choose a model with up to 42mm. This might require removing the spacers between frame and mudguard. To be sure it’s done correctly, have your STEVENS dealer handle the upgrade.